HANCEVILLE, ALA. – Wallace State’s Workforce Development program is offering free short-term Construction Training classes on campus beginning on Monday, June 11. 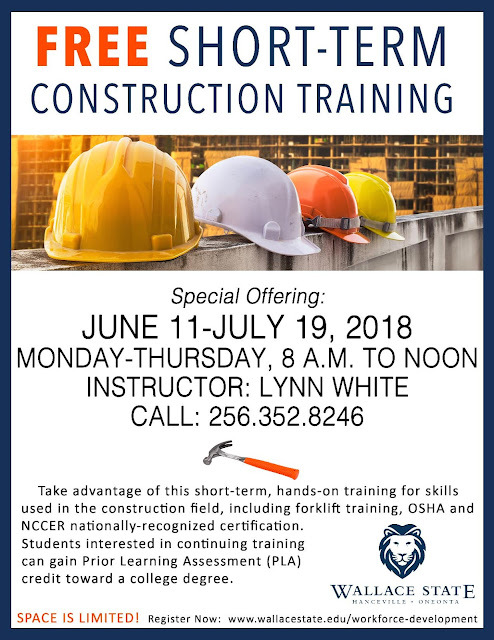 The courses, taught by Wallace State Building Construction instructor Lynn White, continue through Thursday, July 19, meeting each Monday through Thursday from 8 a.m. to noon. Wallace State’s Construction Training classes provide hands-on training for skills used in the construction field, including forklift training. Participants can also earn OSHA and NCCER nationally-recognized certification. Students interested in continuing training can gain Prior Learning Assessment (PLA) credit toward a college degree. You can register for the classes at http://www.wallacestate.edu/programs/workforce-development. For additional information, contact 256.352.8246.